The Mason Natural Leg Vein and circulation is a Spider and Varicose product. Its manufacturers claim that it is quite efficient in treating these kinds of conditions. Great circulation is widely essential for the veins in the body to operate in a healthy manner and this. Spider and Varicose veins are conditions that many people in America have. Forty three percent of the population have them and those numbers are steadily rising. These kind of veins form when people overexert themselves due to stress on the body. Pregnant women are more prone to get them due to the increased body mass, but generally, Spider and Varicose veins develop when one is overweight. It could also be a hereditary factor when one gets them. The truth is, most people don’t tend to them until it’s too late. The conditions worsen and people experience other health complications such as ulcers in the legs. That is when the doctor has no option but to perform surgery to get rid of them. Products like the Mason Naturals Leg Vein and Circulation, luckily; are there to hep treat Varicose and Spider Veins. It is recommended by the manufacturer that adults take two tablets daily with a meal. There are no side effects on the internet for this product. However, there is a warning from the manufacturer which states that this drug should not be taken by nursing or pregnant women without the consultation of a doctor. They also give warning to those who are in the process of undergoing any kind of medical procedures not to take this drug as well, before they get advice from their doctors. Pricing varies but you must be cautious when making any kind of sales on the internet. Do your research first. 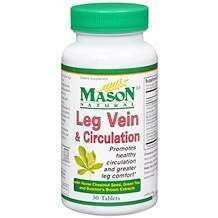 The Mason Naturals Leg Vein and Circulation product is priced at nine dollars and ninety nine cents. It comes in a 30 capsuled bottle which is estimated to last for fifteen days. Unfortunately, this product does not come with any guarantees. Of course, that is something the consumer should be concerned about. The Mason Naturals Leg Vein and circulation is an obvious product for Spider and Varicose Veins. But it clearly has some vagueness when it comes to side effects and the lack of guarantee on the product by its manufacturers. There are too many ingredients in this product. 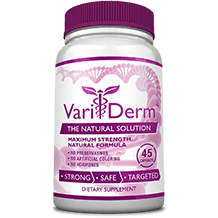 With a total of seventeen ingredients, it is hard to believe that there are no side effects for the product since most of them are not even natural.